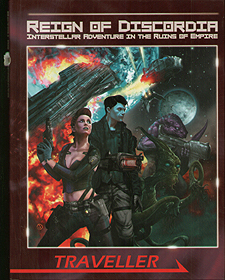 Within the pages of Reign of Discordia, you can fight against the R'Tillek and their crusade of extermination against the known species, fight to protect the independence of dozens of worlds, participate in the cold war between earth and Lamog, haul cargo to the Frontier Systems, involve yourself in the various crime syndicates, work for one of the interplanetary conglomerates and engage in corporate sabotage, play a role in the advancement of one of the interplanetary organizations, salvage starships, and engage in a number of other activities that will bring danger and adventure! Also included is a full length adventure: Virus! You will need the Traveller Core Rulebook to use Reign of Discordia.